Click here to download the Guaranteed 1000 products list as a PDF document. To submit a Guaranteed Claim, please download claim form here. Customers must have an open, active account in good standing to participate in the Guaranteed 1000 program. To be out of stock, the packing slip must show “0” quantity shipped. 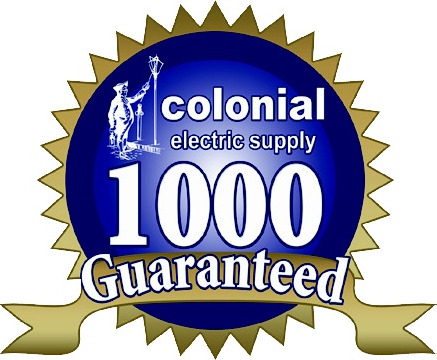 Colonial Electric Supply reserves the right to limit quantities and reserves the right to substitute functional equivalents. Customers can waive this right and therefore, waive program benefit. Wire cuts for will-call and pick-ups are excluded. Cash and COD accounts excluded.